Continuous improvement is not a piece of cake. We tend to spend so much time analyzing our past actions, digging their root causes, remembering how the last sprints went... This can be disturbing and is also a hard job. So not a surprise some people advise to run another kind of retrospectives –retrospectives without looking back. Facilitating collaborative New Year’s resolutions has also been known in the space of agile coaching for quite a while. The idea behind this is to run a collective ideating and dreaming session. The goal in to help the team see itself in a year from now and then also possible derive some actions. 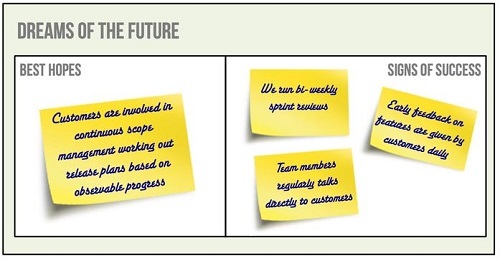 So one could see collective New Year's resolutions as one of many ways of running futurespectives. In this article I’d like to share a very practical piece of advice on how one could run such team dreaming parties in quite a structured and a result-oriented manner. Also without making it too fluffy and groundless. Focused Agile Coaching™ (or for the sake of simplicity and appetite - FOCACCIA) is a set of thinking tools and coaching techniques that I've been designing. They are to help co-create coaching vision and then slice it into measurable and observable coaching releases. The book is being written and we hope to get it out early 2016 as a minibook on InfoQ. 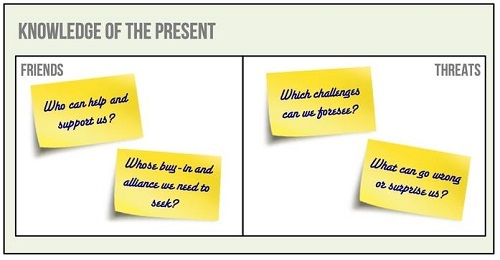 So why Focused Agile Coaching We all want to have visionaries guiding our teams and companies. We all are looking for strong leaders and champions. Scrum teams are particularly picky when it comes to finding a candidate that fulfills the Product Owner's role. ScrumMaster / Agile Coach is a multi-faceted role of a person leading an organization on the learning path to becoming (more) agile. She can be recognized by her attitude and style: rich collaboration, strong belief in the agile values, encouragement of others to lead. Facilitation and coaching are her untiring tools of action. This role implies having a strong vision of "there is a better place" combined with a compassionate empathy to the people who are on the journey. So like Product Owners use design and product thinking tools to ideate, co-create and share their visions, I see ScrumMasters using similar tools for coaching visions and planning. In this light, the Focused Agile Coaching is a toolset just for that. One particular tool of the FOCACCIA method (that is also handy for New Year’s workshops) is the Agile Coaching Canvas. Sounds exciting? Let’s go and check it out. Canvases have been known in the product thinking space as great helpers in obtaining an integral view on a specific product case. Business Model Canvas and Lean Canvas are just few examples to name. The magic behind any canvas is that it helps you first disassemble your challenge into independent areas, analyze and think them through individually. Then once all areas are done, you are invited to have a 30'000 feet outlook on the matter, spot connections between the areas, ideate and craft a unique vision that glues all those parts together, have those long-awaited aha! moments. As the name suggests, the Agile Coaching Canvas helps do the same trick with coaching visioning. 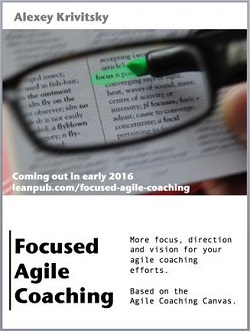 It is designed to serve agile coaches and ScrumMaster as a self-coaching helper. I personally like using it first as an individual thinking tool when ideating about a particular coaching case. Then do it again from scratch as a group exercise with my clients in order to generate shared understanding. So as you can guess it can also nicely work for your New Year’s resolution. Filling in the Canvas is not an art, rather a skill to gain. So the following paragraphs will guide you and your teams in filling the three main parts of it. As in the design thinking and other powerful tools for product visioning, we are starting with empathizing the users and understanding their problems. But in case of the Agile Coaching Canvas we’re empathizing ourselves and trying to understand our own problems. In the middle part of the Canvas there are the quadrants. They are the four Agile Focusing Areas - a part of the FOCACCIA toolbox. The Focused Agile Coaching Guide will provide enough background of how these quadrants are chosen and their deep interrelation, so we won’t be diving into that in this article. So no matter what you do as a coach or a ScrumMaster, you are focusing in a particular moment on one of the four mentioned areas. The goal of the FOCACCIA method is to let you first become aware of that fact, and then secondly start making right focusing decisions. In this part of your New Year's Resolution workshop you will be asking your team to think of the key challenges they are having within each of the areas. We want the teams to explore all four of them. One way of doing this is placing four flip-chart papers (one for each area) with the corresponding titles and asking the participants to write ideas on sticky-notes. Once all stickies are collected, run a series of dot-voting sessions to get the top “winners” in each of the area. As I mentioned above the key idea behind the FOCACCIA method is to help us make better decisions by picking main areas of our focus. So after filling in the flip-charts opening a group discussion on “what shall we focus mainly on during the upcoming year?” can be very insightful. If we could pick just one area out of these four in order to strive for the biggest impact, which one would it be? In which area(s) we might need to make progress before moving to the next ones? Which area(s) it is easy to make first improvements in? Which area(s) have we been already working in? How are the areas influencing each other? The Canvas can be annotated with the results of these discussions to highlight the main focus area(s) and their relationships. Below is an example of how this central part of the Canvas might look like. Of course, it will be different and unique in your case. 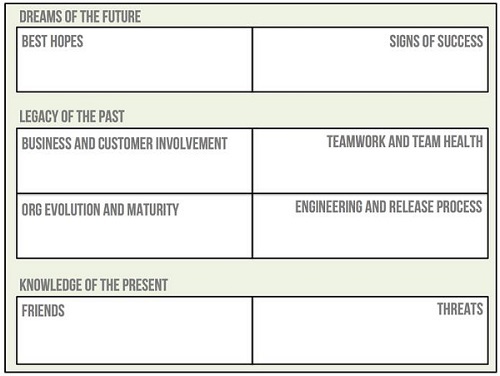 This is a Canvas from a real-life case that is described in details in the Focused Agile Coaching Guide. To give you some background: this is a team that is not doing Scrum (yet). The main organizational issue there is lack of collaboration between the vendor (the team) and the customer (another organization). So as you can see "no scope management" and "no feature acceptance" are the challenges mentioned in the top left corner of the Canvas. 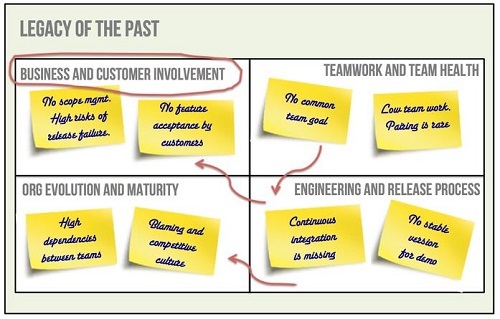 This area is also marked as a focus area - the long-term coaching goal is to fix the customer-vendor relationship. But alone these improvements would not be possible. The red arrows highlight the dependencies: the Engineering area is blocking it and is itself being blocked by the Teamwork area. There is much more to this case, but this example is just to serve as an illustration of stories that a Canvas can help us to tell. So when your middle part of Canvas is ready, ask your team to tell collaboratively a story behind it. Notices how the areas are relate, block and enable each other. See if the story sounds logical and truthful. Having such a poster hanging in the team war room during the next year might work as a good reminder of a collective journey. But we are not quite done yet with our Canvas. I usually offer a break after working on this part of the Canvas, as it is the most energy-consuming one. Digging is a hard and low-paid job, you know. So celebrate and move on. Into the Dreamland! The “Legacy of The Past” that you annotated in the previous part is yours anyway, so you don’t need to carry it along. Park it aside. Move to the next blank flip-chart. Free up some space for big dreams. This part of the Canvas has two parts: best hopes and signs of success. Let’s start with the hopes. There can be many or just one. What’s really important is that they are kept bold, inspiring and strategic. Seeing them live should be treated as real achievement and a reason for a big loud team party. But also it can take long before the dreams come true. Not only that, but also it will require a lot of work. That’s why you need to brainstorm some examples of early signs of success. These are some evidences and examples seeing which will make you sure you’re on the right path. These signs of success are like the breadcrumbs (perhaps of a focaccia) that guided a hero of one fairytale I used to know. You need many of them: a handful for each of your hopes. You can think of the hope and signs of success as a user story (card) with some high-level acceptance criteria (confirmation) written for it. Remember that old 3C pattern? That's exactly that thinking. Will all the hopes come true? Most likely not if we start acting in isolation, ignoring the help we need to rely on and pretending there are no risks. So this third part of the Canvas is your chance to have an open discussion on how to make the hopes real. Who can help and what could go wrong? Keep this part short and focused. You don’t want to put a red stop sign on your best hopes by listing all possible and impossible risks. Instead, you want to make the hopes more real by adding some concrete things to keep in mind: who are our friends to look for and what could be our threats to watch out for. The Canvas might be a good artifact to keep on the wall and/or in the team wiki. But as any other agile tool what is more important are the discussions that happen around it. And the next important discussion to happen is “what do we actually do next?”. You can try working out this question as a part of your New Year's Resolution or also as a separate session. I'd vote for the second option. One obvious reason for that is that working out the Canvas might take you several hours to half a day depending on the team size and its cohesion. Secondly - and it's the main reason - visioning and planning are different mental activities. They need different mindsets and hence different coaching attitude. So running them as different sessions simply works better. There are many ways of facilitating this discussion of “what do we actually do next?”, as there are teams in the world. 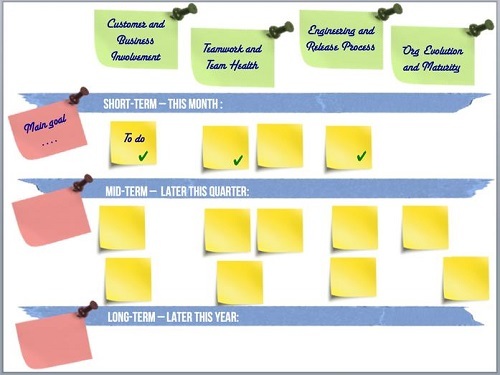 One great tool to steal from the product thinking and apply here is the User Story Mapping (or just 'Story Mapping'). That's why Focused Agile Coaching has Story Mapping as one of its tools to plan further coaching efforts. Story Mapping applied to coaching planning is definitely worth trying. The four areas can serve as the backbone of the mapping (see green post-its on the illustration below). 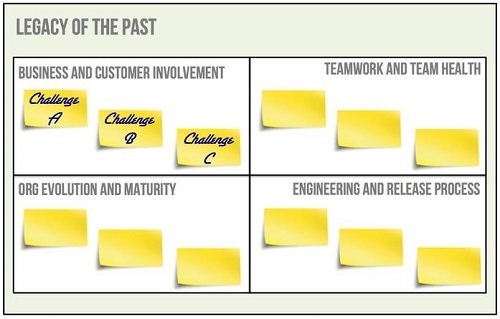 The tasks (yellow post-its) are the specific process improvements, experiments and coaching actions. Like for example: setting up Jenkins as a continuous integration server, scheduling Sprint Review meetings, running a workshop for the Product Owner team, facilitating Release Planning, etc. The actions can be clustered into releases: short-term, mid-term and further-away, each with its main goal(s). See the red post-its and the blue duck tape separating the releases on the illustration above. Depending on your planning horizon this can be: this month coaching plan, this quarter coaching plan and later this year's planning. As any Story Mapping the document is live and will be constantly rearranged and replanned. What is my next focus? What is my biggest goal this month? Next quarter? What is my mid-term plan on improving a specific area? Long-term? Which coaching stance shall I apply short-term: will I teach, mentor, coach or facilitate an improvement? What is done and what is left this month? these are just some of the questions Story Mapping applied to agile coaching can help thinking through. As an agile coach I find it quite helpful to maintain such a map to help plan my personal tactics when coaching teams. More on this in the upcoming mini-book on InfoQ. And for now: I’m wishing you a great start of the New Year and happy coaching! The FOCACCIA method is not limited to the use of futurespectives. It is a set of generic thinking tools to help derive coaching visions and planning. The biggest strength of it that it is not limited to any specific agile method. It is a framework-agnostic toolset. The four central areas are mappable to the four values of the Agile Manifesto, so as the Manifesto itself it is applicable to any specific context: Scrum, Kanban, Scrum at Scale, etc. Speaking about the scaling: there is nothing in the Canvas that tells you to stay on the team level. One can easily use the tool for visioning of enterprise-level coaching. The general rule behind this is that the level you work with the Canvas at (team, multi-team, product organization, or whole enterprise) should be the one where you are empowered to make real impact at. Those strengths (framework-agnostism and level-variability) can also be seen as weaknesses of the method. One needs to have an experienced facilitator and a trained agile coach to guide a group through the Canvas-filling exercise. So as with any of the coaching methods, skillfulness of a coach can make a difference. Alexey Krivitsky is Certified ScrumTrainer, the author of the mini-book Agile Retrospective Kickstarter and a hands-on Lean-Agile practitioner with the first Scrum experiment dated back to 2003-2005. Since then Alexey has been actively engaged in coaching teams and organizations, by working as a ScrumMaster, Agile coach and business trainer. He has co-produced a number of Agile events, including the Agile Eastern Europe Conferences 2009-2015 and is also known for inventing the Scrum Simulation with Lego. More about Alexey Krivitsky on his personal homepage and a blog.